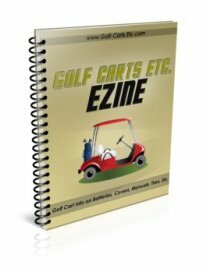 Golf cart wheel covers provide a custom look to your wheels without the price of custom golf cart wheels. 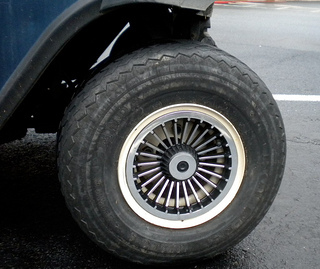 Wheel covers can virtually cover your whole golf cart wheel so it looks like a custom wheel. The covers are available in chrome, black, silver or gold color. The sizes come in 8" or 10." 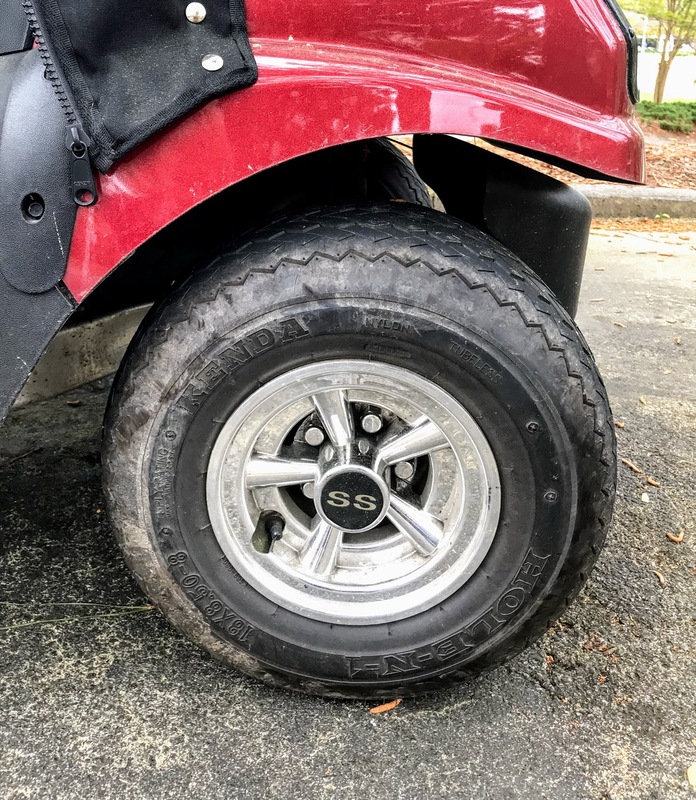 Most golf carts come with a standard white wheel, so covering it up really dresses up the golf cart. Custom golf cart wheels are in the price range of $50 - $200 each, while covers cost between $10 - $20 each. 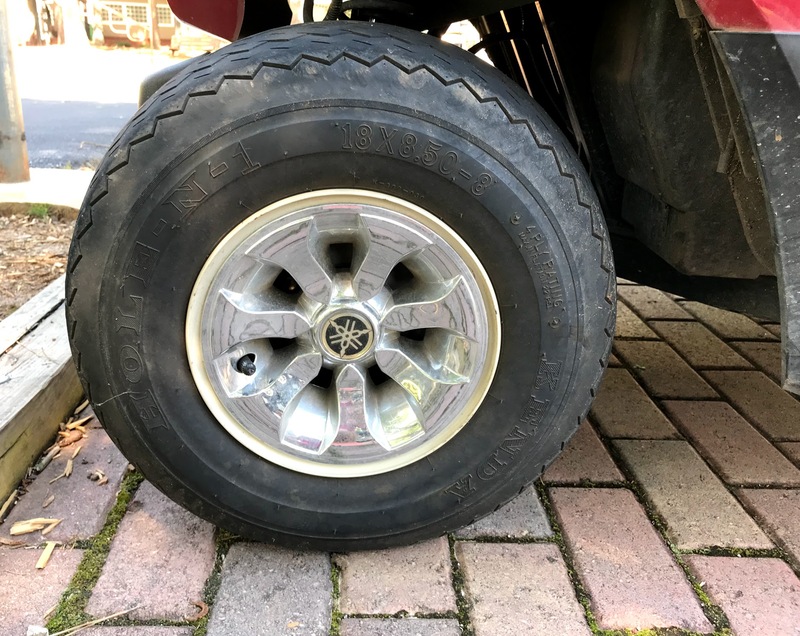 Here is what golf cart tires and wheels looks like without a hubcap. 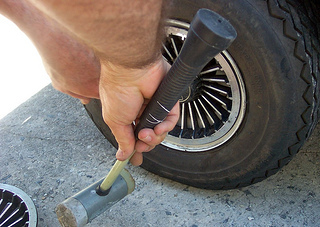 To remove your existing hub caps just pry them off gently with a flat head screw driver in a couple of areas and it will release. Look at the next two pictures and you can see how this small investment really dresses up your golf cart. 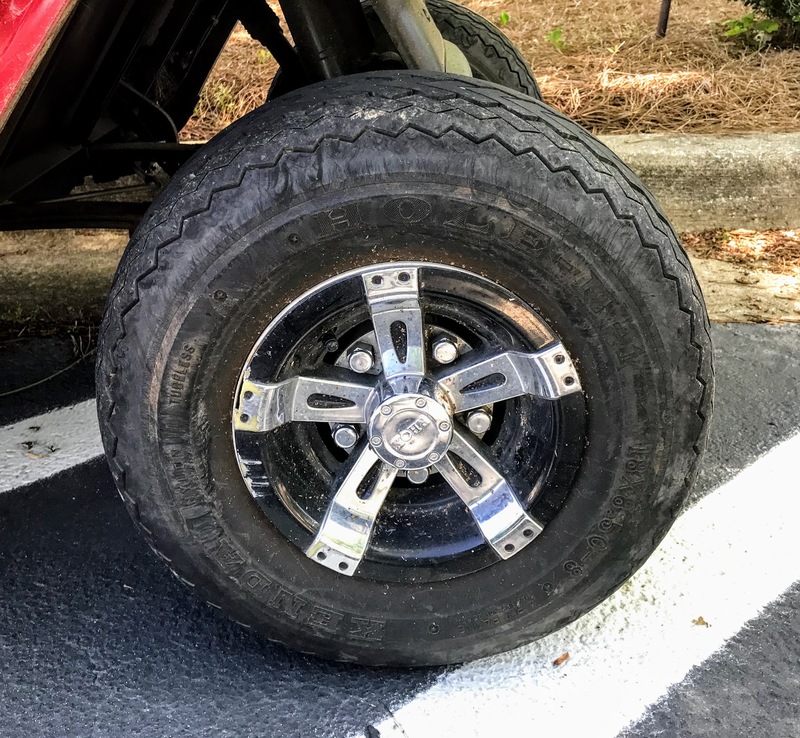 Typical golf cart wheels are 8". Buy this size wheel cover if you have 8" wheels. They come in a set of 4. For the best selection go on-line to buy these. The number of spokes will determine which design you like best and the finishes come in chrome, gold, black, white or beige. 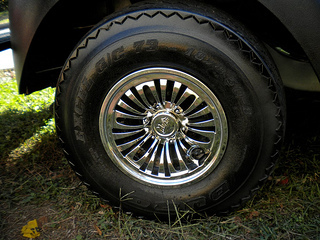 Wheel covers easily snap into place so you don't need to pay for any mounting fees. Since they are made out of plastic, the shipping costs will be minimal or free from Amazon. If you want to go from standard to sporty, consider this set of 4 chrome wheel covers from Amazon with free shipping. Also consider the thickness and number of spokes to determine what style appeals to you the most. 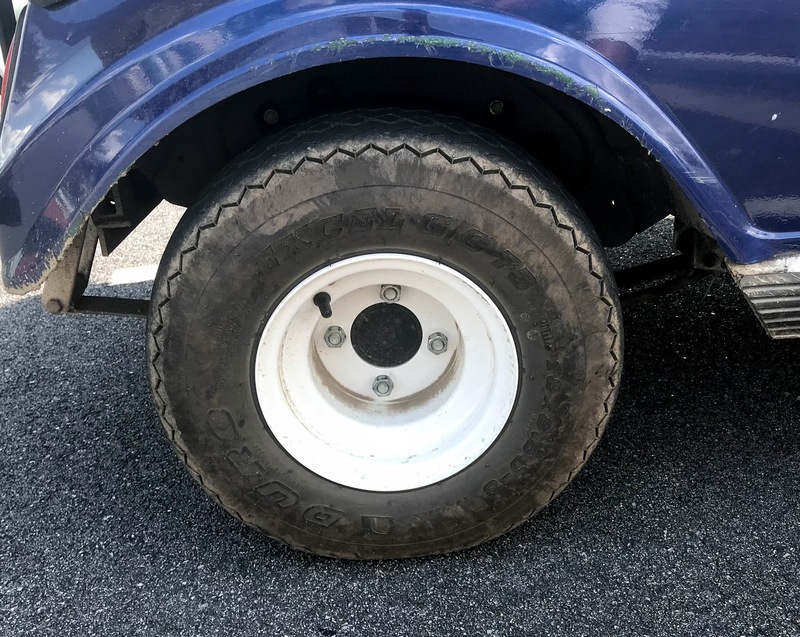 Hubcaps for golf carts are made of heavy plastic and can save you hundreds of dollars compared to buying custom golf cart wheels. Metallic silver and black hub caps jazz up any golf cart without the expense of installing custom wheels. These covers do what they say - they cover up the tire so you all you see is a great looking wheel cover. Yet another chrome look with 7 spokes to give your golf cart a new, fresh custom look. Give your cart an upgrade and new look with these hub caps that fit most golf carts. This size works on any 10" steel wheel. Most of them are made out of chrome looking plastic and snap easily into place. Sometimes the wheel covers are sold individually and others just in a set of four - so be sure to buy 4 of them if sold individually. 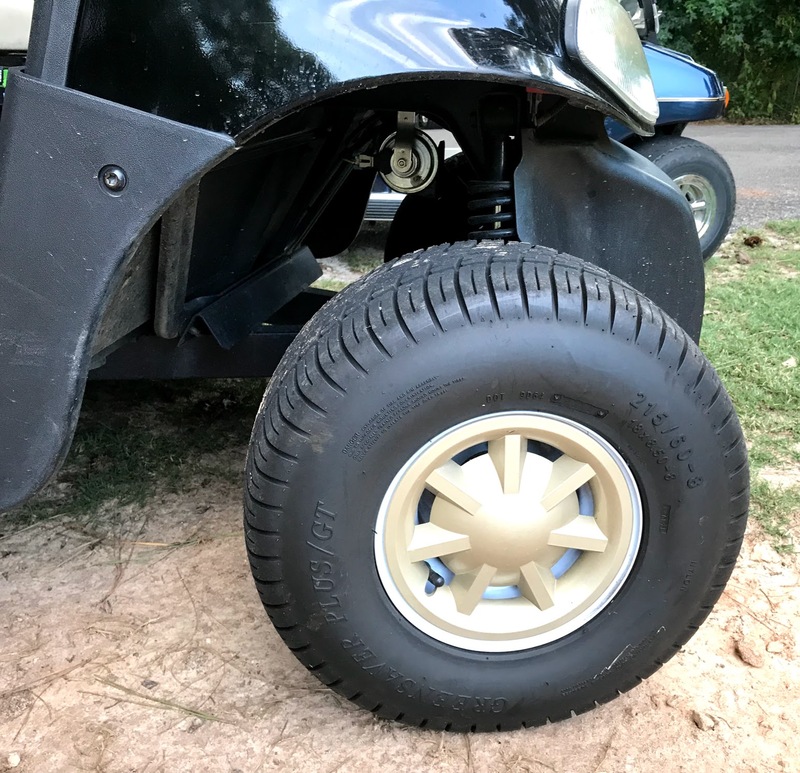 Jazz up your golf cart and save some money by adding these to your golf cart tires.